Given their exploitation and biology (high reproductive rate and short lives) you would predict giant mud crabs to show a strong response to overfishing and/or recovery to the removal of fishing. An excellent paper recently published by Dr Paul Butcher and colleagues tested this prediction by examining the long-term effects of marine park zoning on giant mud crabs in estuaries of the Solitary Islands Marine Park (SIMP), New South Wales, Australia. The authors counted the number of giant mud crabs over a 9-year period within three estuaries of the marine park. Clearly this study involved a lot of hard work and generated loads of data. For the sake of brevity, I’ll just present the findings from Wooli estuary, however results were relatively consistent across all estuaries. During the study zoning regulations were changed which reopened areas to fishing in Wooli that were once previously closed. This allowed the authors to compare the catch rate of crabs between fished versus unfished zones and between areas once previously closed to fishing but subsequently reopened. As anticipated, Giant Mud Crabs responded positively to the removal of fishing by marine park zoning. In Wooli the average catch rate of crabs in unfished areas (Fig. 1 – red lines) exceeded those in fully fished areas (Fig. 1 – green lines) for all 9 years of sampling in both the early and late seasons. For certain years the difference in catch rates between fished and unfished areas were substantial. Similarly, as predicted, the unfished area in Wooli that was reopened to fishing showed a clear decline in the catch rate of crabs (Fig. 1 – red triangle line to green triangle line) in early and late season sampling. In comparison, sampling sites in the area left unfished continued to produce high catch rates of crabs (Fig. 1 – red triangle line to red triangle line) in both seasons. 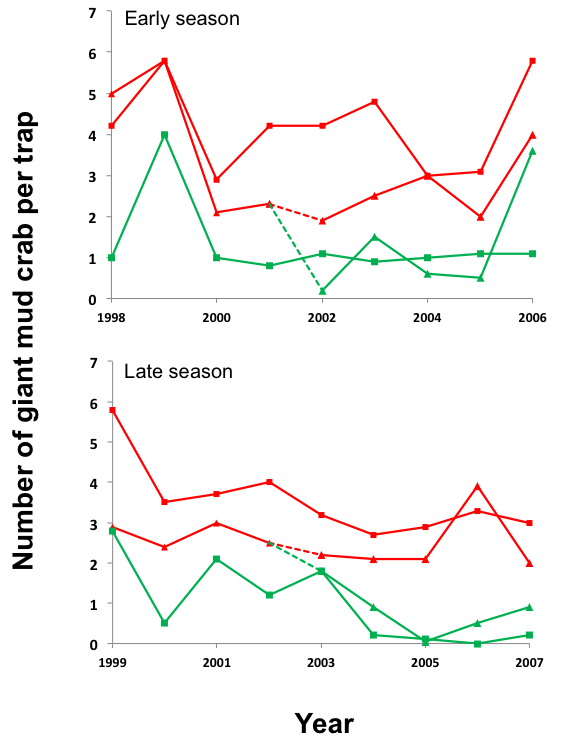 Figure 1: The mean number of giant mud crabs captured per trap during annual early and late season sampling in the Wooli estuary, Solitary Island Marine Park, NSW, Australia. The red lines denote catch rates in unfished zones while green lines catch rates in fished zones. Some sites within the unfished zone with triangles were reopened to fishing following zoning changes (red triangle to green triangle) while other sites remained closed to fishing (red triangle to red triangle). By comparing catch rates between unfished and fished zones and areas reopened to fishing, Butcher and colleagues clearly demonstrate the benefits of ‘no-take’ zones on giant mud crab populations. Their findings indicate that estuarine ‘no-take’ sanctuary zones could potentially provide an effective fisheries management tool for giant mud crab populations. 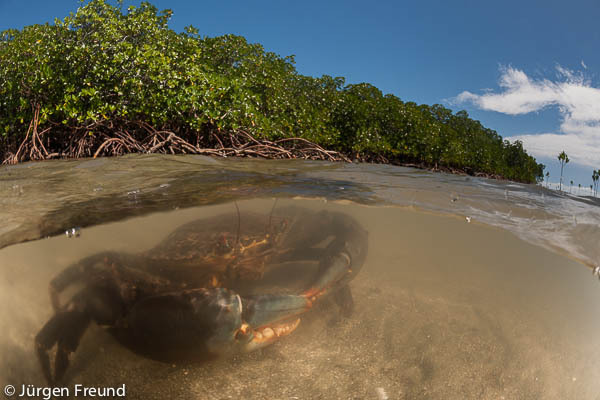 Protecting giant mud crab populations in ‘no-take’ sanctuary zones is also likely to promote estuarine biodiversity and ecosystem functioning. Giant mud crabs are important scavengers and predators within estuarine habitats, thereby playing a crucial role in estuarine food webs. By protecting undisturbed populations of mud crabs, estuarine ‘no-take zones’ are likely to be maintaining and protecting biodiversity and healthy estuarine ecosystems. Butcher, P. A., Boulton, A. J., Macbeth, W. G., & Malcolm, H. A. (2014). Long-term effects of marine park zoning on giant mud crab Scylla serrata populations in three Australian estuaries. Marine Ecology Progress Series, 508, 163-176. To check out more amazing wildlife and nature photographs by Jürgen Freund head over to his website and facebook page – juergenfreund.com and Jurgen Freund Photography – Australia. Rowling, K., A. Hegarty and M. Ives, Eds (2010), Giant Mud Crab, pp 147-150. In Status of Fisheries Resources in NSW 2008/09. Industry & Investment NSW, Cronulla. Grubert, M, Leslie, M and Bucher, D 2014, Mud Crab Scylla serrata S. Olivacea in M Flood, I Stobutzki, J Andrews, C Ashby, G Begg, R Fletcher, C Gardner, L Georgeson, S Hansen, K Hartmann, P Hone, P Horvat, L Maloney, B McDonald, A Moore, A Roelofs, K Sainsbury, T Saunders, T Smith, C Stewardson, J Stewart & B Wise (eds) 2014, Status of key Australian fish stocks reports 2014, Fisheries Research and Development Corporation, Canberra. Nice write up! Cool results from the researchers. Marine park zoning is obviously beneficial for this species. Given their relatively short life span and potential for dispersal, do you think that a rotating system of spatial closures (similar to scallop fisheries) in the un-zoned areas would work as a fisheries management tool? Do they already do that? Anyway, interesting reading! Cheers guys! Cheers Marty! Considering the findings of this study and others (such as Pillans et al 2005) spatial closures could potentially work as an effective fisheries management tool. But I think this would depend on a number of factors. First closures would need to be implemented within the reproductive range of mud crabs and their effectiveness would be dependent on how well the fishery is already managed using other strategies (bag and size limits, bans on taking females etc). I’m not aware if rotating spatial closures are used. Along eastern Australia the network of MPAs aim to conserve biodiversity. However, as indicated by the FRDC report, due to the southward flow of the east Australian current, adult mud crab populations protected by no-take zones in Qld and northern NSW probably supply recruits to fished areas in the south. This suggests that northern MPAs may provide benefits to the mud crab fishery. Long live the mud crabs. I’d hate to see them go the way of Atlantic cod just because they’re delicious.